Assam Chief Minister Sarbananda Sonowal on Monday took stock of the flood situation in Karimganj district and directed the Deputy Commissioner to speed up relief and rescue operations. The Chief Minister while reviewing the flood situation over the telephone also asked the Deputy Commissioner to immediately release the one-time financial assistance to the family members of the flood victims. Moreover, the Chief Minister stressed on ensuring adequate relief to the inmates of flood relief camps and directed the Karimganj district administration to remain alert to tackle any situation. 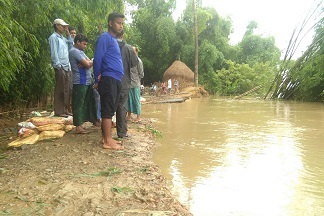 The flood situation in Barak valley of Assam continues to remain grim on Sunday with both the Barak and Kushiyara rivers flowing above the danger level. Assam Water Resources Minister Keshab Mahanta was on a visit to the Barak Valley on Sunday to assess the flood situation. Immediately arriving at Silchar early on Sunday morning, Mahanta visited the flood-affected areas. He was accompanied by local legislators Dilip Kumar Paul, Kishore Nath, Aminul Haque Laskar, Amarchand Jain, Anowar Laskar and chief engineer of the Water Resources department B Rongpi, officer on special duty Dibakar Bhattacharya, executive engineer Achit Deb. The minister surveyed the embankments at Shivbari of Tarapur in Silchar, Borkhola, Katigora, Badarpur, Hailakndi and Karimganj. Notably, six people have lost their lives in the first spade of floods this year in Barak valley.